Busy thinking on where to go for my 71 interior & trunk that need be refreshed completely, I'd love to "enhance" a bit while at it and replace/mod the cheap plastics, add/make custom parts with noble materials. Especially interested in leather, details that makes our 7173 even cooler. I was searching the site to find back a very nice trunk, done I think last year, with leather to look at it in details again, but could not find it back..
Found nice threads on the subject tho.. I'm sure more leather/carpet/wood/aluminum has been sewed/cut/glued/polished since these were posted. If some of you have added a personal touch inside or in trunk and would not mind to show/share/explain how it was done. Please post some picts, thanks! I don't know if I would use wood. It may be different where you live, but here in Florida with the humidity and 6 months of daily rainfall, that wood would be a mess in no time. If I was going to do a project like this, I would consider using composite lumber. Its made out of recycled plastic and comes in various sizes. They also have a material used extensively in Boats that is completely impervious to moisture. Here is an example called White King Starboard. There is also this site on Plastic Lumber and Sheeting used in construction. Either of these would be more suited than wood for such a project. I'm sure they have similar stuff available in Europe. (11-30-2018, 08:48 AM)jowens1126 Wrote: I don't know if I would use wood. It may be different where you live, but here in Florida with the humidity and 6 months of daily rainfall, that wood would be a mess in no time. I'm looking around for a theme, color combos etc.. What would need to be fabricated, to be restored/modified etc.. I have not settled for particular materials yet. I would love to see what others have done in their interior & trunk that goes further than ordering a repop or repaint. anything other than original or "enhanced original" (copy of original but in different material). I'm after that kind of things to make my own sauce, theme, and ensure I have both materials and skills in house ready for the day I'll start work on that part of the project. but for same price, I might fall in love with the work done by someone else and would use another material. Thats why, I'd love to see picts, I know there are perls out there! 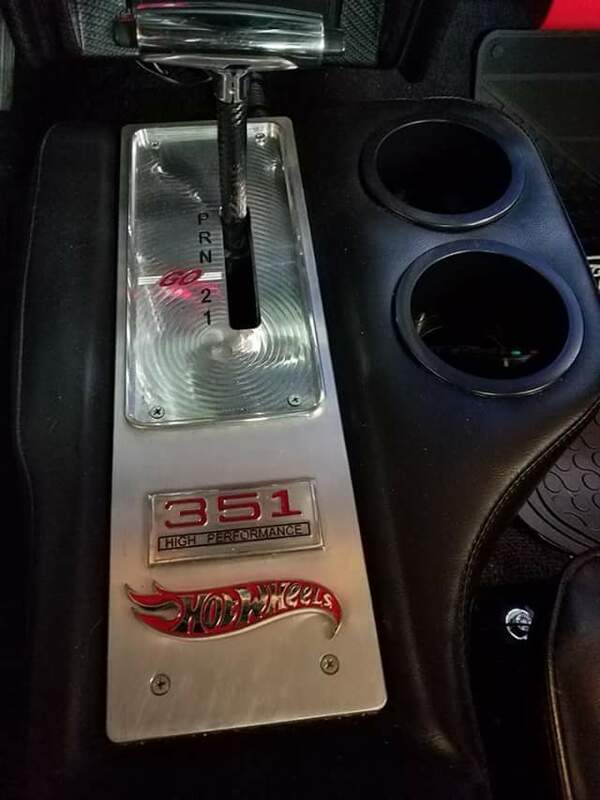 (11-29-2018, 09:13 AM)Fabrice Wrote: Busy thinking on where to go for my 71 interior & trunk that need be refreshed completely, I'd love to "enhance" a bit while at it and replace/mod the cheap plastics, add/make custom parts with noble materials. Especially interested in leather, details that makes our 7173 even cooler. Here are a couple of pictures of mine. Very nice. I like the blue stitching on the leather. Very nice touch. Less than 200.00 from www.stockinteriors.com. no cutting required and a great fit. If you're looking to give the trunk a fresh factory look I highly recommend their kits. I did an aftermarket console with some custom touches. 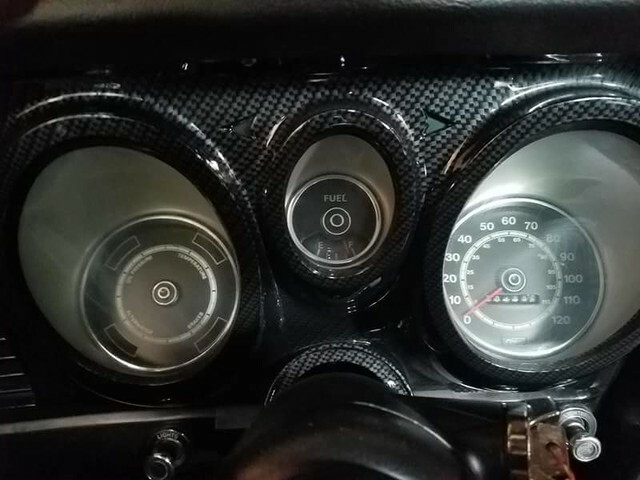 Had the gauge pod carbon fiber plasti dipped. Led lightning was a nice touch as well. I took the factory seat covers ripped them apart and sewed suede in the middle. Did whatever I could to be just a little bit different. Looks great! 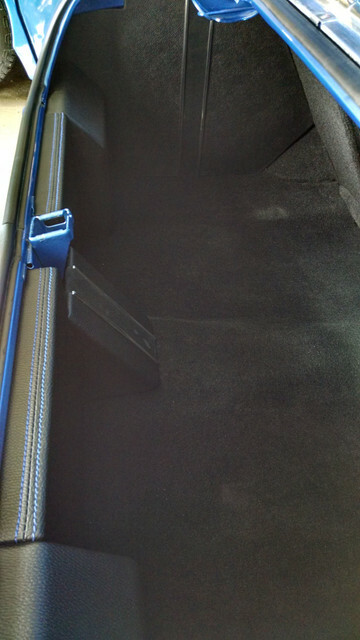 (bookmarked that one) As its a coupe, did you need to make a structure behind the seat to "hang" the carpet there? No visible on the picts, how does it fit to quarters? Or does it stops at the end of floor? On the lid, is it carpet as the floor? Guys thx for posting these nice examples, that's exactly the kind of stuffs I'd like to see more picts of! Interiors & trunks! I'm sure there are many more nice touches like these! 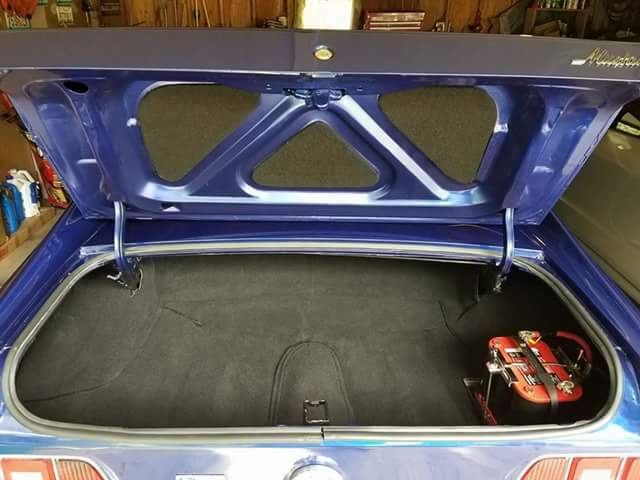 I had seen their trunk kit on their site before and was wondering if anyone had installed one. I used their carpet kit inside with the cut pile and was very happy. The trunk kit was complete. Didn't have to make anything. It does extend all the way to the quarter panel. I'll try to dig up a side pic.